The cherry of the Rio Grande is a highly ornamental plant originating from the state of Rio Grande do Sul, Brazil. The scientific name for pitanga is eugenia aggregata. 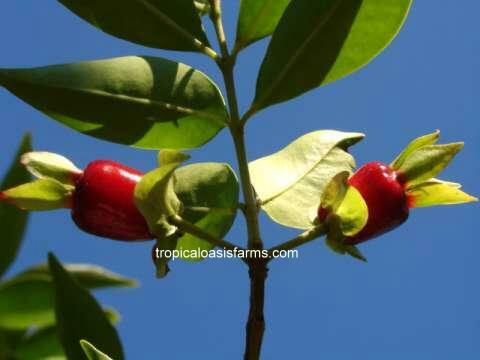 There are several different eugenia varieties from Brazil that produce delicious fruits! Another eugenia variety from Brazil with very tasty fruit is the Pitanga (aka: Surinam Cherry). The Cherry of the Rio Grande does very well when planted in full sun in most Southern California locations, and once established there it usually is fairly drought tolerant and also can withstand several degrees below freezing with little effect. The Cherry of the Rio Grande is an evergreen shrub or small tree which commonly grows to about 15 feet in California. It is not a true cherry and has dark green, glossy, waxy leaves. As the tree grows, the bark peels off showing the bright green trunk underneath. In California, the cherry of the Rio Grande is early flowering in spring with fruits typically ripening in June. The flowers are white and quite showy. The oblong fruit is a beautiful dark red to purple-ish black when ripe, and it is produced soon after flowering. The fruit are highly prized fresh and also as jellies, jams or juices. The fruits also freeze quite well, so they can be picked at maturity and frozen for later use. Cherry of the Rio Grande is usually propagated by seed as grafting has a low success rate, and seedlings usually take 4 to 5 years to begin producing fruit. Cherries of the Rio Grande are easy to grow, requiring very little maintenance for the growth of healthy, productive plants. Fruit size and quality depends mostly on adequate water supply at the time of fruit development in mid-late spring. The plants should be watered regularly, but especially during bloom and fruit development. The cherry of the Rio Grande has fairly good drought tolerance. The cherry of the Rio Grande requires very little pruning just enough to keep an attractive shape. We offer Cherry of the Rio Grande plants for sale in a variety of sizes ranging from 4 to 8 years old. We have date palms available in all sizes, including male date palms for pollination and for landscaping, and female medjool date palms for date production. We also have zahidi date palm offshoots available. Our fresh picked medjool date program has been a huge success! At certain times of year, we can ship orders for organically grown freshly picked medjool dates, as well as other date varieties and also organically grown mesquite seed pods. We also occasionally have a variety of other rare and exotic fruits that were grown organically and allowed to fully ripen on the tree. Our fresh medjool dates are available in September-October each year. SHIPPING: For small to medium size trees, we recommend that customers personally pick up their own trees and take them home in their vehicle. Local delivery of your selections to your driveway can usually be arranged (only in Southern California, minimum tree purchase $150) with a delivery cost from $30 to $150 depending on the round-trip mileage (150 mile maximum round-trip travel distance). Transport for large trees/palms can also be arranged. We do not offer "mail order" shipping for plants & trees. MEDJOOL DATE PALMS: Our Medjool date palm offshoots (and our other palm varieties) are grown near Palm Springs, in California. 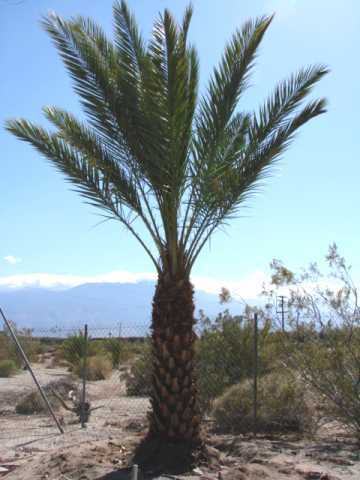 Medjool date palm offshoots in 15 gallon pots are available for pick-up in Rancho Cucamonga, California, by appoinment only. Delivery of Medjool date palms to homeowners in Southern California can be arranged. We do recommend homeowners hire an experienced landscaper (we are not offering landscaping services, sorry!) for planting & irrigation services. 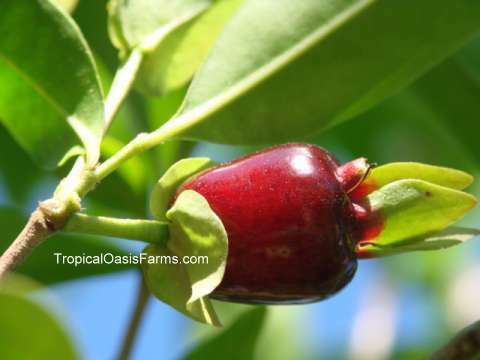 SUB TROPICAL FRUIT TREES: Available for pick-up in Rancho Cucamonga, California, by appoinment only, at one of our two locations. To make an appointment & get directions, please call 909 941 1060 a few days prior to your desired appointment time. PAYMENT: We accept Cash, Check, American Express, Visa, Mastercard & Discover. You can pay in advance or at the time of pick up. Grafted trees, trees grown from cuttings, off-shoots, and air layered trees are described as such. All other trees are seedlings. FRESH MEDJOOL DATES: organically grown in California, fresh picked medjool dates are available in October each year. GUARANTEE: We guarantee our plants and trees to be in good condition at the time of sale. SUITABILITY: For questions regarding the suitability of plants or trees for your climate (and how to care for them), the CRFG website has lots of great information. © Copyright 1999-2018 - tropicaloasisfarms.com® - All Rights Reserved.